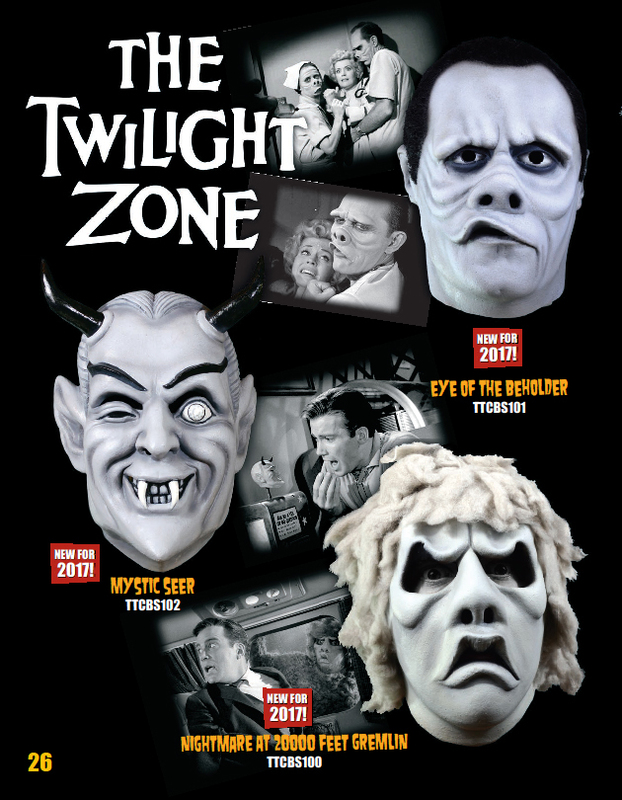 Trick or Treat Studios has unveiled their 2017 catalog of new masks, costumes, and props coming out this year, and while we have already covered a lot of what you can expect (here), today we are focusing on the company’s new line based on the greatest TV show of all time, The Twilight Zone. The announcement was made last year that Trick or Treat Studios had reached a deal with CBS for the license rights to both Star Trek (see the ’75 Captain Kirk mask here) and The Twilight Zone. The new masks depict the Mystic Seer from the episode “Nick of Time”, the deformed doctor from the episode “Eye of the Beholder”, and the Gremlin from the classic episode “Nightmare at 20,000 Feet”, all presented in glorious black and white as originally seen on the show. You can view photos of lots more new 2017 masks from Trick or Treat Studios in our gallery here!